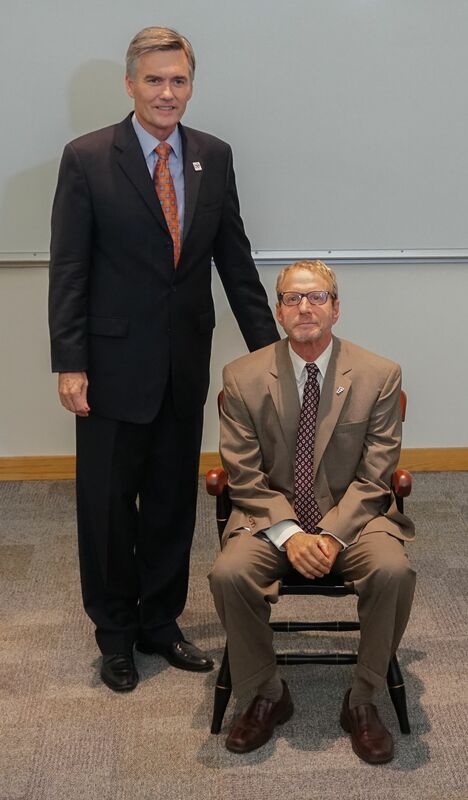 The University of Florida Health Science Center held it’s fifth annual Celebrating Distinction ceremony to recognize those faculty members who have recently been named to an endowed professorship or chair. The event was held October 26, 2016 in the DeWeese Auditorium at the McKnight Brain Institute. The Department of Psychiatry had four faculty members receive recognition at this year’s event. The Addiction Medicine Division’s Scott Teitelbaum, MD received the Pottash Professorship in Psychiatry and Neuroscience. The Pottash Professorship was established in 1991 by Carter A. Pottash to support a professorship in psychiatry or neurosciences at the UF College of Medicine. Scott Teitelbaum, MD was the recipient of the Pottash Professorship. Carter A. Pottash specializes in addiction psychiatry and is president of Florida Consultation Services, providing psychiatric consultation to patients in Palm Beach. He aslo serves as president and chair of Stony Lodge Hospital in Ossinin, New York. He graduated from Yale University School of Medicine in 1984 and completed residencies at Yale, Baystate Medical Center in Springfield Massachusetts. Pottash is also a clinical professor of psychiatry at New York University and a distinguished fellow of the American Psychiatric Association. Dr. Teitelbaum serves as vice chair of the UF College of Medicine department of psychiatry and the training director for the UF Addiction Medicine Fellowship. He is also the medical director of the UF Health Florida Recovery Center, which offers detoxification, stabilization, outpatient rehabilitation, counseling and support groups for those suffering from drug and alcohol addiction.